72 F o c u s O n I n d u s t r y M ajor announcements from three companies at the SEMA (Specialty Equipment Market Association) Show in Las Vegas gave the event some additional swagger. Here is what they had to say about their product offerings for 2019. KENDA KENETICA, THE NEXT GENERATION How do you improve on one of your core products? By improving it in every way. at's what American Kenda Rubber Industrial Co. Ltd. did with the Kenetica KR17 at its two-year-old technology center in Green, Ohio. e result is the Kenetica Touring A/S KR217. 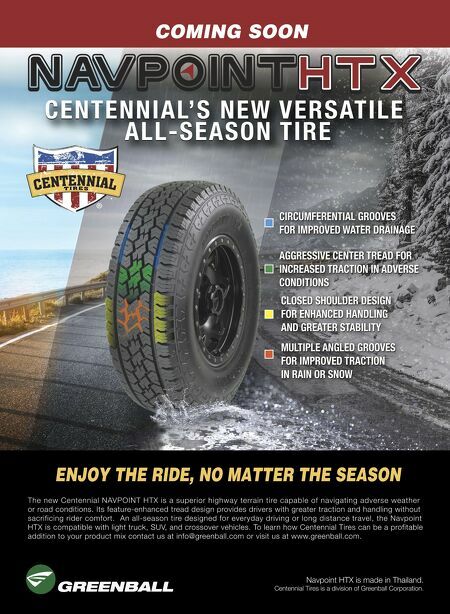 e second-generation tire is superior to the more than 10-year-old tire it eventually will replace in steering/ dry handling, ride comfort (including reduced noise), dry braking, wet braking and wet handling. Snow traction was improved dramatically. Although improving rolling resistance was not specifically targeted by Kenda USA's engineers, that, too, is improved. "We optimized the design of the tire to perform at a lighter weight to be competitive from a cost standpoint," said Dan Shavers, manager of tire develop- ment at the tech center. "We focused on reducing weight without giving up any performance." e new tire is backed by a 60,000-mile limited tread wear warranty and a UTQG (Uniform Tire Quality Grading) rating of 580. at compares to a 50,000-mile warranty and UTQG rating of 500 for the Kenetica KR17. "Kenda is providing significantly upgraded performance compared to our popular KR17 at a comparable value price point," added Brandon Stotsenburg, Kenda USA's automotive vice president. e Kenetica Touring A/S KR217 will be available in 43 black sidewall sizes ranging from 175/70R13 82H to 235/55R18 100H. 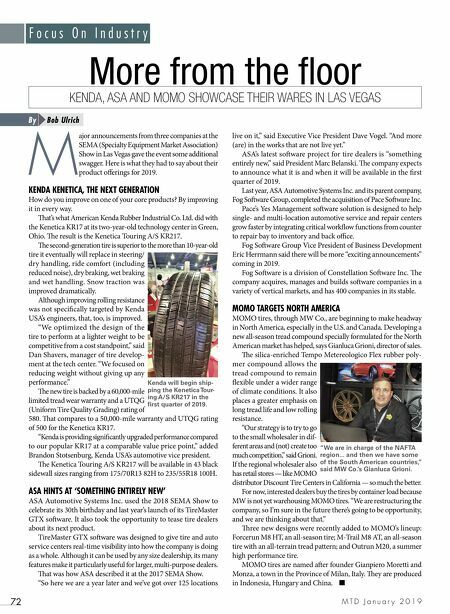 ASA HINTS AT 'SOMETHING ENTIRELY NEW' ASA Automotive Systems Inc. used the 2018 SEMA Show to celebrate its 30th birthday and last year's launch of its TireMaster GTX soware. It also took the opportunity to tease tire dealers about its next product. TireMaster GTX soware was designed to give tire and auto service centers real-time visibility into how the company is doing as a whole. Although it can be used by any size dealership, its many features make it particularly useful for larger, multi-purpose dealers. at was how ASA described it at the 2017 SEMA Show. "So here we are a year later and we've got over 125 locations live on it," said Executive Vice President Dave Vogel. "And more (are) in the works that are not live yet." ASA's latest soware project for tire dealers is "something entirely new," said President Marc Belanski. e company expects to announce what it is and when it will be available in the first quarter of 2019. Last year, ASA Automotive Systems Inc. and its parent company, Fog Soware Group, completed the acquisition of Pace Soware Inc. Pace's Yes Management soware solution is designed to help single- and multi-location automotive service and repair centers grow faster by integrating critical workflow functions from counter to repair bay to inventory and back office. Fog Soware Group Vice President of Business Development Eric Herrmann said there will be more "exciting announcements" coming in 2019. Fog Soware is a division of Constellation Soware Inc. e company acquires, manages and builds soware companies in a variety of vertical markets, and has 400 companies in its stable. MOMO TARGETS NORTH AMERICA MOMO tires, through MW Co., are beginning to make headway in North America, especially in the U.S. and Canada. Developing a new all-season tread compound specially formulated for the North American market has helped, says Gianluca Grioni, director of sales. e silica-enriched Tempo Metereologico Flex rubber poly- mer compound allows the tread compound to remain flexible under a wider range of climate conditions. It also places a greater emphasis on long tread life and low rolling resistance. "Our strategy is to try to go to the small wholesaler in dif- ferent areas and (not) create too much competition," said Grioni. If the regional wholesaler also has retail stores — like MOMO distributor Discount Tire Centers in California — so much the better. For now, interested dealers buy the tires by container load because MW is not yet warehousing MOMO tires. "We are restructuring the company, so I'm sure in the future there's going to be opportunity, and we are thinking about that." ree new designs were recently added to MOMO's lineup: Forcerun M8 HT, an all-season tire; M-Trail M8 AT, an all-season tire with an all-terrain tread pattern; and Outrun M20, a summer high performance tire. MOMO tires are named aer founder Gianpiero Moretti and Monza, a town in the Province of Milan, Italy. ey are produced in Indonesia, Hungary and China. ■ More from the floor KENDA, ASA AND MOMO SHOWCASE THEIR WARES IN LAS VEGAS M T D J a n u a r y 2 0 1 9 Bob Ulrich By Kenda will begin ship- ping the Kenetica Tour- ing A/S KR217 in the first quarter of 2019. "We are in charge of the NAFTA region... and then we have some of the South American countries," said MW Co.'s Gianluca Grioni.